Mexican immigrants began to settle in Detroit at the beginning of the 20th century. They were attracted by the jobs available in the automobile industry and the rest of the rapidly expanding industrial base. Like other immigrant ethnic groups, Mexicans came to Detroit intent on providing a better life, and future, for their families. They opened businesses like specialty grocery and retail stores, barbershops, and restaurants. They bought homes, educated their children, served in all branches of the military, and became model Americans. What they brought to Detroit were family values, faith, and a strong work ethic. 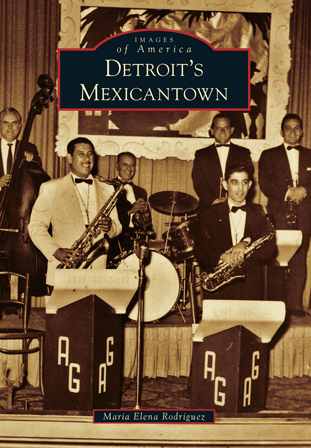 Detroit's Mexicantown offers a glimpse into when and where the community started. Mexican American author Maria Elena Rodriguez was born and raised in Detroit. She leads an interesting life that revolves around her family. She has been called a cultural chameleon for embracing the best that both Detroit and Mexico offer. Her early memories include attending the Thanksgiving Day Parade, shopping at Hudson's, and sipping a hot mug of Vernors at the Shapero Drug Store. She is proud of both her Detroit and central Mexican roots. The new young Mexican immigrant generation navigates exceptionally well in both cultures; they too are cultural chameleons.